Please call owner Ted at 772-283-4270. Boat is in Palm City,Florida. 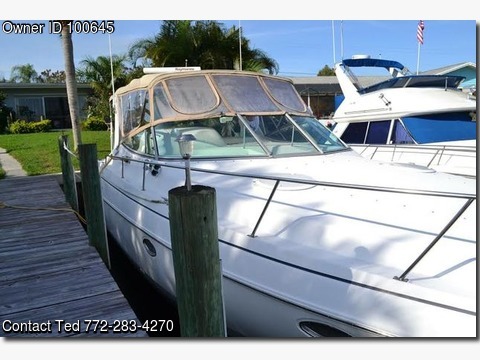 BOAT OWNER'S NOTES for 1997 CRUISER'S YACHTS Esprit 3570 with LOA of 40' in EXCELLENT condition, call boat owner Ted @ 772-283-4270. OVERVIEW: Layout is set for 2 Staterooms which will sleep 4 comfortably, Extended Swim Platform, Full Canvas only one-year-old, Full Galley, equipped with Stove/Microwave, Coffee Maker and Refrigerator, Head including Shower, Flat screen TV, Stereo: Sony system, & 1000 Watt Amp, 8 each 6 &1/2" Kenwoods, & a 10" Subwoofer, iPod & SiriusXM Radio, AM/ FM/CD. ENGINES: The engines are twin MERCRUISER 454's 350hp, 40 MPH Top speed,& Cruise at 27 Knots. FEATURES & EQUIPMENT: Halon system, Battery Charger, Power Inverter, Kohler Generator, Windlass, 72 mile radar, Color Chart plotter, VHF, Depth Finder. FINAL NOTES: The boat has been on a lift since new, Only the last year in the water, Professionally detailed monthly, Bottom and Zincs cleaned and checked monthly. This boat is truly LOADED! $49,000.00 OBO, Contact Ted @ 772-260-2083.